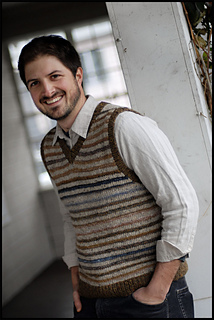 This basic striped vest pattern is worked in worsted weight yarn in the round from waist to collar. 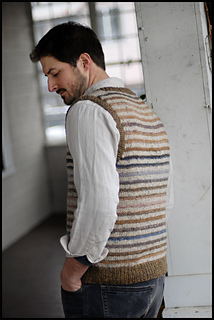 The armhole openings and v-neck are shaped using cut steeks. 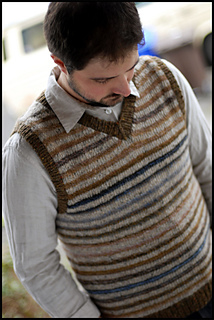 We encourage you to explore and experiment with striping different yarns! 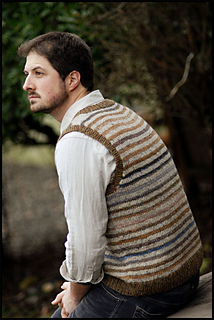 The stripes in the sample shown were created by alternating a solid cream wool tweed with a self-striping handspun Shetland wool yarn of the same weight. This pattern was originally printed in Wild Fibers Magazine, Volume 6, Issue 1 (the 5th Anniversary Issue). 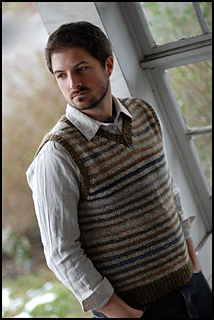 If you are knitting this pattern from the magazine copy, please see the Errata below. The PDF download has corrected information and does not need any errata substitutions.